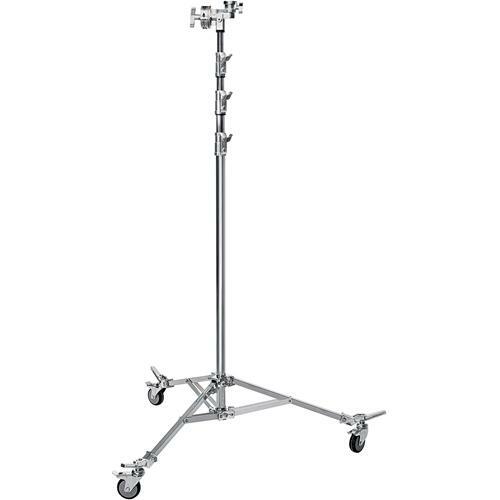 Combo Light Stand 310 cm with wheels [SHD-STN-002] - €6.00 : Shadeena Rentals - The more you rent, the less you spend! This mobile combo stand is made of steel that makes it to be very sturdy and time resistant. The stand features a three-leg base with a folding brace in each leg. Also, the included wheels for the legs increases the mobility of the lighting. The combo stands are available with a “rocky mountain” leg used to lean the stand or to level the stand on uneven ground. - 28mm die cast aluminum socket and 16mm stud. - double braced legs for extra stability, resistance and safety. - captive lock offs thread into rust free steel. - shock-resistant square section tubing. - leveling leg for better stability. - all knobs are made of metal and threads are riveted for preventing losses. - this type of surface finishing lasts longer - prevents oxidation and gives the product a polished look.